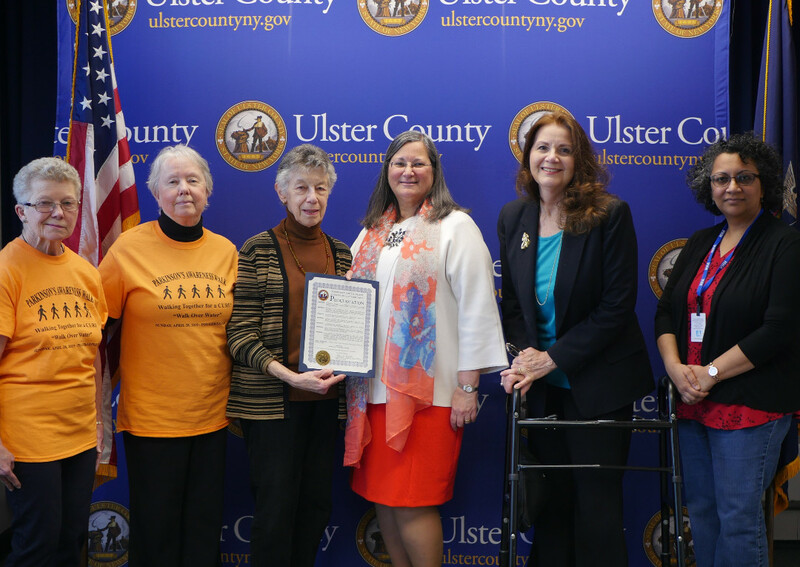 Kingston, NY – Acting Ulster County Executive Adele B. Reiter proclaims the month of April as Parkinson’s Awareness Month in Ulster County. Acting County Executive Reiter was joined by the Ulster County Commissioner of Health and Mental Health Dr. Carol Smith and representatives of the Parkinson’s Disease Support Group of the Mid-Hudson Valley and the Ready, Set, Go! Support Group in Kingston to highlight the month. According to the Parkinson’s Action Network, the Parkinson’s Foundation, the American Parkinson’s Disease Association and the National Institutes of Health, there are over one million Americans diagnosed with Parkinson’s disease. Symptoms of Parkinson’s Disease include: tremor (trembling) in hands, arms, legs, jaw or head; stiffness of the limbs and trunk; slowness of movement; and impaired balance and coordination. Provides support and education to people with Parkinson’s Disease, their families and caregivers. Meets the 4th Friday of month, 10 am-12 pm, except for dates in Nov. and Dec. Unitarian Fellowship, 67 South Randolph, Poughkeepsie, NY 12601. Nancy Redkey, Chair of Steering Committee. Light refreshments served. Info: 914-475-2793; http://www.midhudsonparkinsons.org/ (This group is very well attended with over 70 participants traveling from Ulster County and farther. Ready, Set, Go! - Free peer-led support Group with MHA. This group will be holding regular meetings beginning April 25th and will meet every Thursday, 2:30-3:30 pm at the Mental Health Association in Ulster County, 300 Aaron CT, Kingston. For information please contact Theresa Joseph at 845-339-9090, ext. 2206. Meets every Thursday, 10am-11:30am. Location: St. John’s Episcopal Church, 207 Albany Ave., Kingston, NY. 10 am - 11:30 am. Pictured Above (from left): Members of the Parkinson’s Disease Support Group of the Mid-Hudson Valley - Mary Carroll, Ellen Withall, and Anne Olin; Acting Ulster County Executive Adele B. Reiter; Ulster County Commissioner of Health & Mental Health Dr. Carol Smith; and Theresa Joseph, Facilitator of the Ready, Set, Go! Support Group.